Faced with one of the worst water supply forecasts in over 50 years, the Technical Management Team this week agreed to lower the flow target at McNary Dam from 220,000 cubic feet per second to 180 kcfs, beginning today (May 1). Even at that, flows at McNary will have to increase from last week's average flow of 160 kcfs. TMT will revisit the situation and its decision at its meeting next Wednesday (May 6) and will continue to evaluate the water supply forecast and flows at dams on a week by week basis, as juvenile migrant salmon begin to wend their way downstream. The federal biological opinion for Columbia/Snake salmon and steelhead calls for flows of 220 kcfs to 260 kcfs during the spring juvenile salmon migration season, which is achievable during most years. However, in low water years, the BiOp allows for flexibility in managing the situation. "This is turning out to be a much worse year than anyone had thought," said Paul Wagner of NOAA Fisheries. "The question is how to manage flow in a low flow year." The concern is, "what is the right flow?" for the time spring migrants are moving down through the system. Forecasts in terms of runoff are changing weekly and keep getting worse. Just last week to this week, the May flow forecast at McNary has dropped by 20 kcfs, Wagner said. "It's unlikely we'll hit 220 kcfs or anywhere close through this period," he added. Flows at McNary Dam averaged 165 kcfs Tuesday (April 28), 146 kcfs on Wednesday and 128 kcfs yesterday. With TMT's Wednesday decision, flows will have to rise to the 180 kcfs target and one way to do that is to continue to draft the Grand Coulee Dam reservoir. Grand Coulee, which was built in 1938, requires gate maintenance every third year, regardless of the water supply forecast. That requires a drawdown of Lake Roosevelt, the reservoir behind the dam, to be drawn down to an elevation of 1,252 feet until May 8 when the maintenance is complete. Refill to upper flood control at elevation 1,282 feet will begin after the maintenance and continue into midsummer. Every 10 kcfs provided to McNary Dam for one week translates into two feet of elevation drop at Grand Coulee, so to bring the flow up to 180 kcfs will take the two feet. Once refill at Grand Coulee begins, the ability to augment downstream flows is diminished from one of the main tools river managers have, Wagner said. TMT is made up of representatives of federal, state and tribal fish and wildlife and hydro power management entities. Their goal is to monitor conditions and consider in-season Federal Columbia River Power System operational management strategies that might be employed to improve conditions for fish within the system, and particularly salmon and steelhead stocks that are protected under the Endangered Species Act. When looking at April through August water supply forecasts, this year is turning out to be the fourth worst year in the past 55 years. The current water supply forecast measured at The Dalles Dam, downstream of McNary Dam, is for 64,935 million acre feet of water. The worst year was in 1977 with 49,419 maf and the average water supply across the 55 years is 87,532 maf. 2015 comes in at number 51 on the list of water supply years, with 55 being the worst. 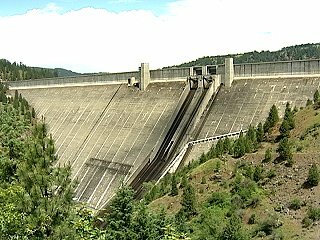 For a list of water supply years at the Dalles Dam, go to: www.nwrfc.noaa.gov/water_supply/ws_ranking.cgi?id=TDAO3&per=APR-AUG. The same holds for the Snake River Basin where water supply in 2015 also falls to the 51st ranking. For a list of water supply years at Lower Granite Dam, go to: www.nwrfc.noaa.gov/water_supply/ws_ranking.cgi?id=LGDW1&per=APR-AUG. The runoff forecast at Dworshak Dam in Idaho's Clearwater Basin is not on the rise, either, and the current operation of releasing 7.5 kcfs of outflow is outpacing the inflow into the dam's reservoir. Managing water storage and flows during a low water supply period from Dworshak into the Snake River's Lower Granite Reservoir during the juvenile salmon migration is also a concern for TMT. Cool Dworshak water is often used as water temperatures heat up in the lower Snake River and is typically saved for summer flow augmentation. "A pool of cool water is seen as essential" at that time," Wagner said. The outflow at the dam has been running at 7.5 kcfs since April 24, according to Wagner, and TMT is debating whether to alter outflows to 5 kcfs or even 2.5 kcfs. However, TMT will hold flows at the current level until next week. The situation would be evaluated each week, balancing the need for flows for migrating fish and the ability of Dworshak Reservoir to have a shot at refill during this low water year.